Some people plant trees in their neighbourhoods. Some people go on nature walks. Some people clean up the local rivers and lakes. Some people start a campaign to make their cities greener. All noble efforts, all important initiatives. ...we must ponder upon the impact of our consumerist lifestyle on the environment. Let us be honest. 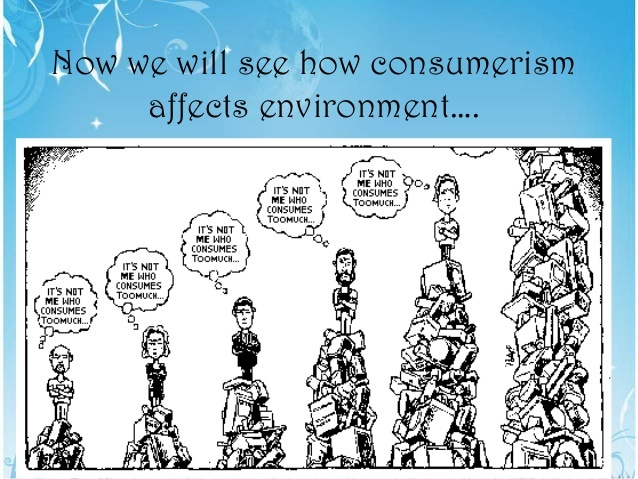 Do we worry about how our consumption patterns and spending habits impact the environment? What happens to all the stuff we discard when we buy new stuff? What happens to all the plastic packaging that we end up adding to the garbage dumps every time we purchase a new product? From where are all the natural and energy resources coming to manufacture all the goods we keep on purchasing? What about the fuel costs to ship the products all the way from China, Philippines, Malaysia or wherever else these products are being manufactured? What about.....what about....so many questions to ponder upon when we start on this path of reflection. But the key question remains -- Why do we keep buying? Do we really need all the things we buy? Or are we just buying to satisfy some desires, some wants in the hope that acquiring more things will bring us happiness? Do we know how to carefully discern between what is really a need and what is a desire when we enter a store or step into a shopping mall? Like everyone else living in this age dictated by the two mighty trends of consumerism and commercialism, I also struggle with this dilemma of how to buy exactly what I need, and how to control the urge to possess and acquire more and more? A personal seeking to become more self-aware and a quest to understand the larger societal trends gradually led me to explore in greater depth the topic of growing commercialism and consumerism in India. I became interested to look into different dimensions and aspects of this issue, all of which eventually took the form of an essay titled, "Commercialism and Consumerism in Today's India," included in my recently released ebook - The Thinking Indian: Essays on Indian Socio-Cultural Matters in the Light of Sri Aurobindo. On this World Environment Day, I take the opportunity to share below two brief excerpts from the essay. One of these also includes some powerful words from the Mother to help us develop a sense of discernment, an ability to distinguish between what we really need and what we can do without. What can you or I do individually to grow beyond our identities as consumers and commercial beings? I am reminded of a statement I read a few years ago—“Capitalism can only utilize certain feelings for its own purposes; it cannot create them” (Varma, V. P., The Political Philosophy of Sri Aurobindo, 1960/1990, p. 192). When I first read it, I said to myself—how simply he presents a really deep and complex idea! We generally like to blame American or Western style capitalism—I have done it so many times myself—for many of the economic woes of developing countries like India. But then the very human feelings (frailties is a much better word, perhaps) of possession, acquisition, greed for wealth, power to exploit and extract from those that are weaker than us, etc. are so easily ignored in our incomplete analysis of how to make the world better. We don’t want to objectively examine and accept these frailties and work towards a deeper transformation of our individual nature. Why? Because that is such a hard work, it almost seems impossible. But then a part of us always knows that nothing else would ever work, it hasn’t. This is true for everyone, everywhere. Let each one of us look deep into ourselves and determine how much are we responsible for this rampant commercialism and consumerist culture, how much do we want to move beyond this age, and what, if anything, are we doing in that direction. This is the only way out. This brings us to an important, perhaps the most important, issue—how should we deal with our desires to possess and acquire material things. This, in turn, also compels us to examine the difference between material needs and desires. The Mother has explained this point beautifully in one of her talks in 1951. If one is in a state of total indifference or detachment about what one has and doesn’t have, and if one is quite sincere, that which is a need will be automatically fulfilled. At a second level we see situations when “one is preoccupied with one’s needs, if one thinks of them, tells oneself, “Truly I must have this”, it is not often that it comes to you; so you are obliged to do something to satisfy yourself and, if you have the means, to go and buy the thing.” But the problem begins to get serious because there are people, forming the great majority, “who always take their desires for their needs….They are convinced that without this or that one cannot live...” (CWM, Vol. 4, p. 383). To see the previous post in the series, Reminders to self, click here. To see all Reminders to self, click here. To see the post written last year for the #worldenvironmentday, click here.